During August–September 2004 a salvage excavation was conducted at Horbat Devela, in the midst of a residential neighborhood in the village of Daliyat el-Karmil (Permit No. A-4249*; map ref. NIG 20420–35/7327–8; OIG 15420–35/2327–8). The excavation, on behalf of the Antiquities Authority and financed by the Electric Company, was directed by A. Shadman, with the assistance of V. Essman and V. Pirsky (surveying), L. Yihye (GPS), T. Sagiv (photography), T. Kornfeld (drafting), D.T. Ariel (numismatics) and E. Yannai (consultation). The site had been surveyed in the past by Conder and Kitchner (SWP I:303); a trial excavation was conducted along the lower northeastern part of the tell (S. Golan, Permit No. A-4130; unpublished). Four squares in three areas (A–C) were opened in the current excavation, revealing three settlement layers with walls and floors from Iron Age I, the Early Roman and the Byzantine periods. Square A1: c. 30 m northeast of Square B2. 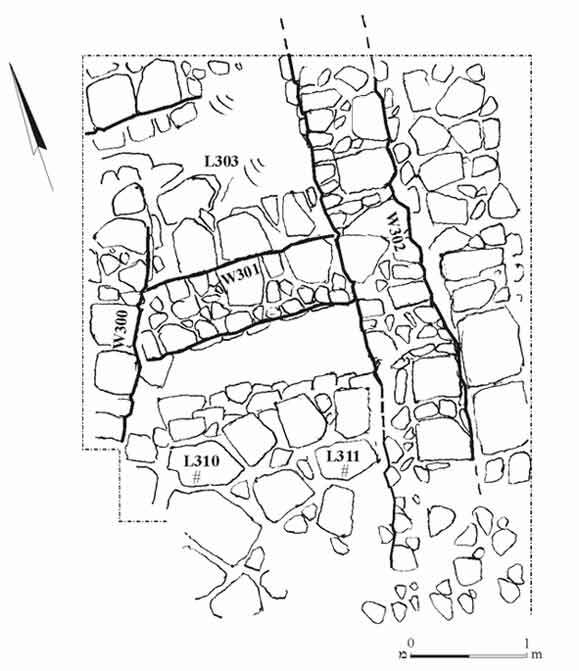 A section of a stone pavement (L310; 1.5 × 2.0 m) that comprised large flagstones (c. 30–70 cm; Stratum 1; Fig. 1) was exposed c. 10 cm below surface. The pavement’s bedding was a homogenous fine soil and small stone layer (thickness 20 cm) that extended across the entire square. The stone pavement, which abutted the wall to the west (W300), continued beyond the limits of the square. The potsherds on the pavement and in the bedding dated to the Byzantine period and included a bowl (Fig. 2:1) and a cooking pot (Fig. 2:2). Two sections of another flagstone pavement (L311; c. 1 × 1 m) were exposed half a meter below Floor 310 and ascribed to Stratum 2. Two walls were also ascribed to this stratum: Wall 302, which was a double wall (?) oriented north–south and W301 that abutted it and was aligned east–west. Potsherds from the Roman period and a Roman coin (IAA 97974) were discovered on Floor 311. Potsherds dating to Iron Age I were found in L303, some 30 cm below Floor 311 and above the end of a fieldstone wall (?). These included a cooking krater (Fig. 2:3) and pierced handles (Fig. 2:4), which may date the wall. Square B1. The square was excavated from surface to bedrock (depth 1.5 m) and contained a mix of dressed stones, tesserae, potsherds and modern waste. It seems the area was prepared for development in recent times. Square B2 was located c. 40 m north of Square B1 and excavated to a depth of 2.5 m below surface. Archaeological remains were found, not in situ, including dressed stones and Byzantine potsherds. Square C1 was located c. 100 m east of Square B1. A wall oriented north–south, whose foundation was built of small fieldstones and the upper courses––of large stones, was exposed in the western corner. The wall was preserved c. 1.5 m high and was abutted on the west by a 1 × 1 m section of a flagstone pavement. The wall was adjoined by an east–west wall, built of dressed stones and founded on the stone pavement. The fill on the floor included Byzantine-period potsherds and a coin (IAA 97975). A fill that contained a number of dressed stones and a refuse pit, which was dated to the Byzantine period on account of the potsherds in it, were excavated east of the north–south wall. A section of an east–west wall (Stratum 2) founded on bedrock was exposed at a depth of c. 3 m below surface. Roman-period potsherds were discovered nearby.